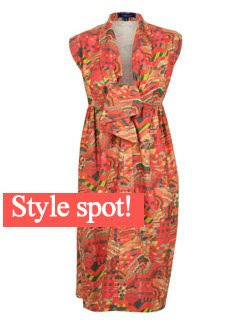 We're excited to see that international style bible Vogue has caught up with us here at DeviDoll in highlighting the modernised graphic tribal print as a top trend for Summer 09. The current issue of Vogue dedicates a full page to what it's calling a minimalist take on maximalism, or in other words, a more subtle, wearable and urban version of full-blown tribal patterns. We spotted that star of the season during our trend-scouting six months ago. While the cold weather was biting, we DeviDoll stylespotters were gloriously indulging in the most gorgeous summer dresses, tops and swimwear, picking out the perfect ethical pieces for effortless and sophisticated summer style. Vogue is calling this fashion story a "vital burst of colour and exoticism for those of us dwelling in colder climes". We absolutely agree! This Mociun Caravan tie-front dress, one of several on-trend Mociun items to choose from right now in our dresses section, is a perfect piece. The 'Caravan' print is in the season's boldest colours, and it can be easily accessorised for day or evening. In fact, it would work wonderfully for a summer wedding. Caitlin Mociun, designer and founder of the label, uses her imagination not just in fabric prints, garment patterns and silhouettes but in the sustainable materials she uses – yak, hemp and organic cotton.